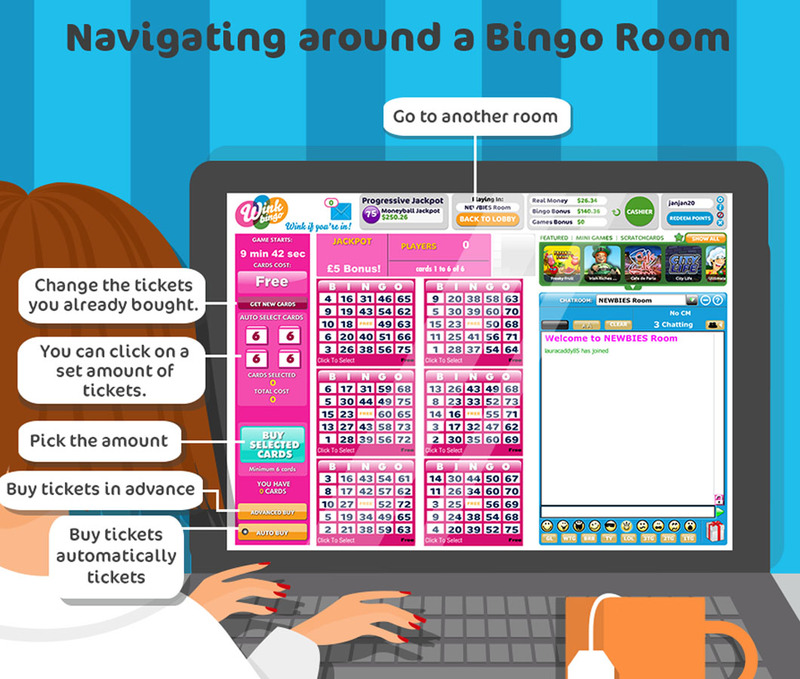 You’re all well-acquainted with traditional bingo, but how many of you know what an online bingo room really looks like? Well, to be disarmingly honest, it’s exactly what the name says: a room (albeit virtual) to play bingo via the Internet. This means that all of the entertainment from the traditional halls where bingo is usually being held can be played while relaxing in the comfort of your own home, or from wherever you happen to be when you feel the urge to play. It’s like visiting a website to check the latest news or watch a video, but this time you enjoy your precious bingo game instead. The online bingo offer comes in many variations: 90-ball, 75-ball and even 5 line bingo, just to mention the most popular ones. All games available have different prize amounts, so you can choose the one you like best without any hassle. 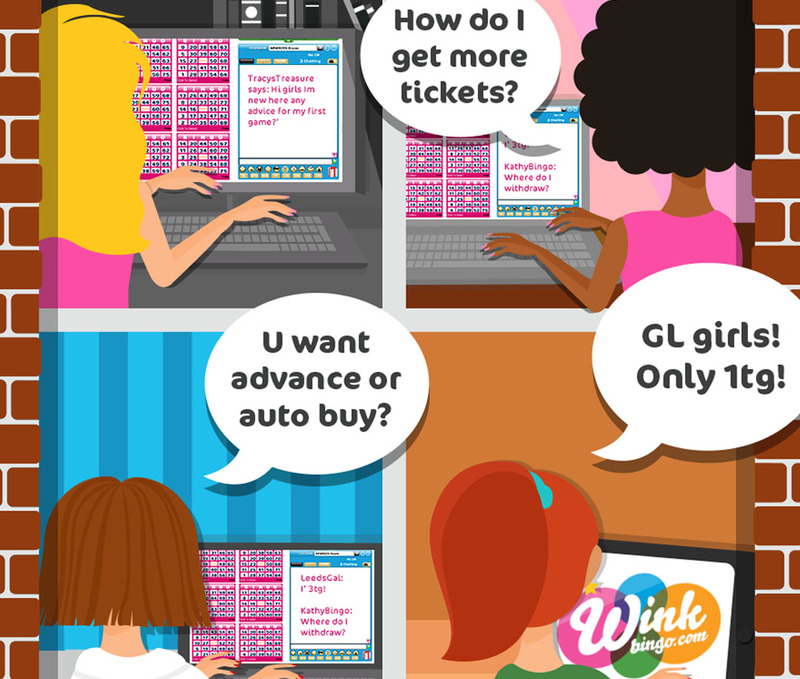 The bingo tickets are within reach, just pick the amount you want and then click “Buy Selected Tickets”. If you’re a member, you can easily choose the option “Auto Select Strips,” meaning you can click on a set amount of tickets without having to click on the actual Ticket strips. You’re unhappy with the numbers you got? Is your lucky number missing? Well, you can change the tickets you already bought by clicking “Get New Tickets”. The name of the room you’re playing in is usually displayed above the button “Back To Lobby”. Before the next game begins, a countdown will pop up, letting you know if you have time to grab a quick cup of tea or not. You’ll be able to Advance Buy and Auto Buy tickets. The “Advance Buy” feature allows you to select tickets that will play automatically, even if you’re away from your computer or mobile device. Don’t worry though – if you win, you’ll receive your glorious update! The “Auto Buy” option allows you to buy tickets in advance too, but this time you’ll have to be logged in to be able to play the games. You will also be able to view the ‘”Jackpot” prize amount, the juiciest prize that’s so damn tough to get your hands on! Remember though, different Jackpots have different winning conditions. Check them all and find the one that makes you suddenly religious! You can also check the number of players participating in the game as well, the number of those who are members in the room, as well as the game pattern. If you want to jump from one room to another, there is a button called “Lobby”. Push that and you’ll instantly reach a webpage displaying all the available bingo rooms and some other useful details. You don’t feel spoiled by Fortuna in your actual bingo chamber? Feel free to migrate to another one! Here you travel in the blink of an eye. Are you a Chat-Room Juggler? 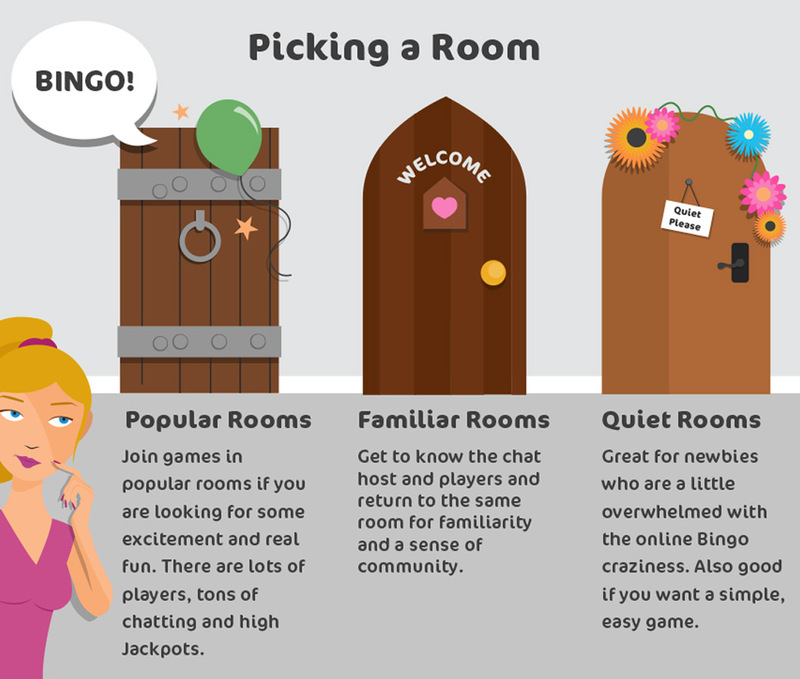 One of the biggest differences between an online bingo room and a classic brick and mortar room is that in the virtual rooms you can jabber incessantly. A caveat, though: politeness and a minimum of etiquette are always to be followed. Nothing shady happens here! You engage in talking with other players and with the chat host (CH) through the chat box that allows all members chatting with each other as well as reading what other players type. To use this socializing feature, you just need to click on the chat window and start writing your thoughts to share.You bored by the chin-wag of other players? Well — you can just ignore it completely! The chat host (CH) is there to keep the rooms warm an friendly, meet and greet the bingo players, and play funny chat games with them. Moreover, if you have any questions or small silly doubts, the CH will promptly and jovially assist you. I’m 1tg for £1000! You’re What? As any other field of entertainment, online bingo has its own lingo. Of course, it’s not a labyrinthine gibberish, and you’ll see that practicing it is very similar to sending text messages or engaging in online chat. Users in the bingo room will type comradely acronyms, like WTG = Way to go, or GL = Good luck etc. No doubt, there are a lot more lingo terms and expressions, and players will often use them to keep each other amused while in the bingo rooms. For example, if someone writes “I’m 3tg!” this means that he’s 3-to-go, that is, he just needs 3 more numbers to get the bingo. From there he can go to 2tg, 1tg and then start praying hard to get the WTG from fellow players (which is the common message to compliment a bingo winner). Members can also amuse themselves with ‘Smiley’ faces (also known as emoticons). You are probably well familiarized with these acrobatic glyphs since… they are omnipresent! Emoticons are used to indicate your emotions or attitudes, and to adorn your messages with them you just have to click on the images at the bottom of the chat box and to send them into the chat room. This way you can spice things up a bit or just bring your mood into the chat as a funny facial gesture. If that’s not enough, you can send virtual gifts to other players or even to the Chat Host! You only have to click on the gift box that appears next to the emoticons menu. Who knows? Bingo romance might blossom! WTG – Way to go (used when a player wins a bingo game). GL – Good Luck (fellow players would type this when someone is getting close to winning bingo). BRB – Be Right Back (used when a player goes off for a few minutes). LOL – Laughing out loud (used when players are laughing madly). 1tg – 1 to go (1 more number to winning the bingo game). 2tg – 2 to go (2 more numbers to winning the bingo game). 3tg – 3 to go (3 more numbers to winning the bingo game). TY – Thank You (well, this one explains itself!). Picking the right room name can be tricky. The room has to tie in with the site’s theme, the type of game, and, most importantly, it has to blend in with the room design. Let’s say you have a bingo site that’s themed around a wonderland motif. Your room names would need to match this imaginary ambience. Names like Alice in Wonderland, The Tea Party or even The Mad Hatter’s room are exactly what you should look for. Why Players Love To Play In The Same Room?